US president Barack Hussein Obama has picked a winner in the Middle East, and it’s not Israel. 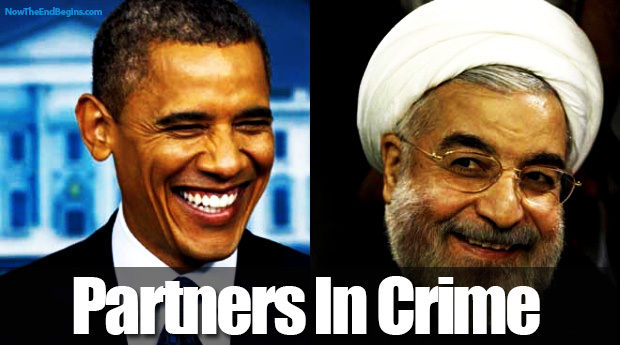 In an unprecedented move, Obama is restoring all trade, diplomatic and commercial travel ties with the terror-sponsor nation of Iran. Yahoo News: Tehran (AFP) – Iran and the United States are to establish a joint chamber of commerce within a month, with direct flights also planned, an Iranian official said Wednesday in a newspaper report. “Iran-US chamber of commerce will be launched in less than one month,” Abolfazl Hejazi, a member of Iran’s Chamber of Commerce, Industries, Mines and Agriculture, told the English-language Iran Daily. In the wake of a historic accord on Sunday between Tehran and major powers on Iran’s controversial nuclear programme, Hejazi also said his country was ready to start direct flights to the United States. After the 1979 revolution in Iran, Washington severed diplomatic relations with Tehran following the seizure of its embassy in Tehran, during which Islamist students held 52 US diplomats hostage for 444 days. According to Hejazi, the project which he said had already been registered in the United States would allow the two countries to work towards restoring ties. Hejazi also said the government has authorised the private sector to launch joint activities and that Iran was ready to establish direct flights to the United States. Flights would connect Kish Island in southwest Iran with New York, he said. “This is because Kish Island is a free trade zone and Iranian passengers who have US citizenship will not need to obtain visas to enter it,” he said.